These are quality, large Heart shaped, engraved key rings with a photo (and optional) text on the front (should you wish us to add a name or date etc) and personalised text on the back. They are made from luxury, mirror shine, stainless steel; they will not tarnish over time and make a stunning, personalised keepsake and are practical too, a special, personalised, keepsake at your fingertips! These items are engraved, not just printed onto so the engraving will not rub off; the engraving is scratched into the surface of the item and is permanent. 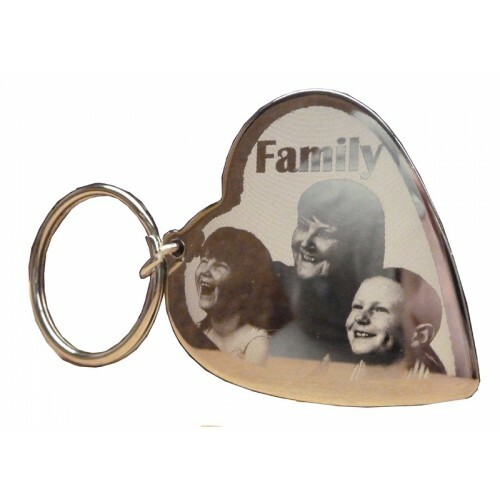 These engraved photo heart key rings are large enough to have a family photo or more than one child in the photo if you wish to, or you can simply have one large photo of your child, a really beautiful keepsake. Please note that these are not made in colour, although the image can be taken from a colour photo, it will still be monochrome when engraved, as the picture is an engraved image in the surface of the metal, give a personalised gift that will be treasured for years to come. This is a very personalised keepsake as you can choose what text and photo(s) you want on your keepsake, text can be engraved alongside your photo if you wanted a name or date added for example & a personal message, or even a poem added to the reverse of the key ring & for a small extra charge, we can even do a photo on each side of the key ring. Our stunning, personalised photo engraved key rings are created by a detailed etching technique, which relies on the contrast between the light and dark areas of a photo, so the clearer the photo you have, the clearer the effect will be when it is engraved. When the light falls on the photo key ring it gives your photo a three-dimensional holographic effect & it will look clearer in certain light than others, there is no printing involved in the production of an engraved photo key ring, it is all engraved. The price includes FREE UK Mainland postage, for all other areas there will be a small extra charge. Photos should be clear and straight on of the desired person/object, we may be able to remove the background to enhance your photo, but this is not always possible to do and so you should ensure that the photo is good quality and clear for us to print, we need photos that have good contrast between the subject and the background to ensure clear results, this way we can be sure of creating the best possible piece for you. These are quality engraved key rings with a best man suit (and optional) text on the front (should y..
A Bridesmaid keepsake key ring is a quality engraved key ring with a bridesmaid dress (and optional).. This is a large, curved heart pendant necklace with an engraved photo on it (and optional) text on t.. These are quality, chunky engraved key rings with your photo (and optional) text on the front (shoul.. These are quality engraved key rings with your photo (and optional) text on the front (should you wi..
Photo engraved keepsakes make amazing personal gifts for you. These are quality, chunky engraved key.. The Day You were Born, Birth Details keepsake key ring is a quality engraved key ring with baby's bi..
Our in memory, chunky engraved key rings with your photo or scanned prints (and optional) text on th.. Details This is a stainless steel, engraved fingerprint key ring, featuring a fingerprint and a n.. These are quality, chunky engraved key rings with your own Soundwave on the front and personalised t.. 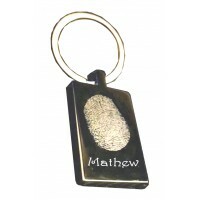 These are quality, chunky engraved key rings with your hand and/or foot print(s) and optional text o.. These are quality, stainless steel engraved key rings with your hands and/or foot print(s) of two ch.. These are quality, three children hand print and/or footprint engraved key rings with your hands and.. Details This is a stainless steel, engraved paw print key ring, featuring one or two paw prints and.. Details This is a stainless steel, engraved pet photo key ring, featuring a photo of a loved pet an.. 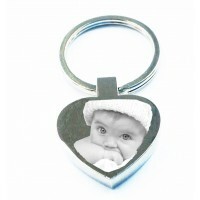 These are quality, Engraved Hand Print Footprint Key Ring Heart, they are chunky engraved heart key .. These are quality, Engraved Photo Key Ring Heart, they are chunky engraved heart key rings with your.. These are quality, Photo Engraved Zippo Style Lighter with your photo (and optional) text on the fro.. Details This is a stainless steel, engraved pet photo necklace, featuring a photo of a loved pet an.. Details This is a stainless steel, engraved paw print, heart shaped key ring, featuring a paw print.. 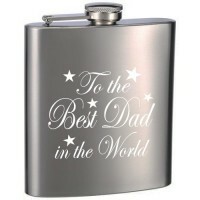 This quality, stainless steel hip flask text is engraved on the front with any simple message and a .. 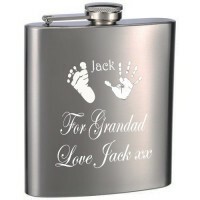 This quality, stainless steel Engraved Personalised Hip Flask is made especially for you using your ..
Key Ring Heart Mummy of an Angel, this quality stainless steel key ring is engraved on one side with..